Located 27 km off the North Queensland coast, Lizard Island is Australia's most northern island at just over 200 km north of Cairns. Comprised of 1,013 hectares of National Park and more than 20 beaches and lagoons, Lizard Island is a unique and secluded holiday destination. A relaxing and luxurious lifestyle is key on Lizard Island, even its name suggests laid back days spent lazing around its shores. Aside from its stunning natural environment, the island is also home to a great range of leisure facilities including a number of bars and restaurants, fitness activities, tours and an indulgent day spa to complete your experience of total relaxation. Accessed from Cairns by air, Lizard Island offers a tranquil escape on the breathtaking Great Barrier Reef and is studded with soft white sand beaches and gorgeous fringing reefs. Offering award-winning accommodation, the island is home to a deluxe range of villas, suites, pavilions and facilities that have attracted national and international acclaim for their excellence. 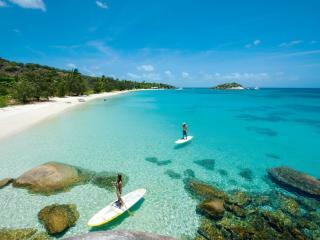 Lizard Island is home to some of the most luxurious island beachfront accommodation in Australia. Lizard is a child free island allowing travelers to soak up the areas natural beauty in peace and quiet. Of course it's Lizard Island's stunning natural paradise that makes it such a draw card for holiday makers. Accessible only by a private plane, children under 10 years are not permitted and there are no day trippers to interrupt the tranquillity leaving guests of the island free to explore the lush tropical oasis and discover the beauty that is hidden all around the island. One of the best ways to experience the many stunning sights of the island is by snorkelling or scuba diving the colourful coral reefs and lagoons. Lizard Island is also renowned for its proximity to Cod Hole, one of the Great Barrier Reef's most popular diving locations offering the opportunity to get up close and personal with the massive Potato Cod. There are also plenty of spectacular beaches on shore as well as glass bottom boat tours and a great range of leisure activities including sailing, fishing and bush walking.